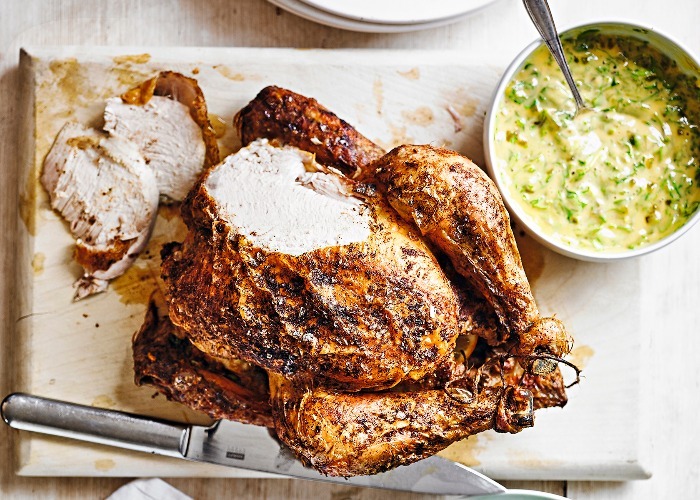 Jazz up a roast chicken with a zingy watercress and ginger mayonnaise. Combining peppery watercress and fiery ginger, the mayo is the perfect accompaniment to the moist, paprika-roasted bird. Mix the olive oil, ground ginger and paprika together with salt and pepper, and brush over the chicken skin. Put the lemon in the cavity of the chicken and place the bird in a roasting tin. Roast in the oven for 45 minutes per kilogram (2.2 pounds), plus 20 minutes (about 1.5 hours in total) until the chicken is cooked through. When the thigh is pierced with a skewer, the juices should run clear. Rest for 10 minutes before carving. While the chicken is cooking, make the mayonnaise. Beat the egg yolks with the garlic and mustard using an electric hand-held whisk. Gradually drizzle in the oil, beating as you go so that the mixture stays thick and creamy. Stir in the vinegar and seasoning, then fold in the ginger. Pick the leaves from the watercress and chop, then stir into the mayonnaise. Serve the chicken with the mayonnaise, steamed new potatoes and green beans.